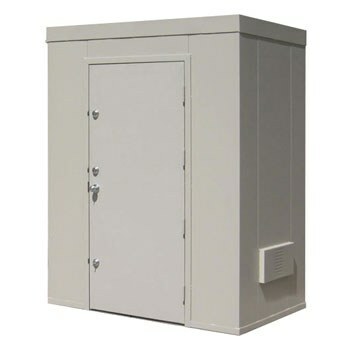 6-person Securall Storm Shelters provide piece of mind for you and your family. Designed to be placed outdoors, inside of your garage, or basement and anchored to a concrete slab. These units are designed with space and life saving aspects in-mind. Keeping the depth at a meager 4 feet, yet still allowing room for you and your family. If you decide to sell your house in the future it may also add additional value to your property and add a unique selling feature. These units are constructed of 12 gauge, formed steel wall sections which are welded together for ultimate strength. The roof is constructed in the same fashion and is also welded to the rest of the structure. High-capacity bolt down anchors provide for proper anchoring to your concrete surface. A heavy-duty 36 inch FEMA 320 door allows for easy access while also providing sturdy resistance to high winds and debris impacts. 3 deadbolts and a strong, lockable lever style handle, all keyed alike, secure this door. Heavy-duty bolt down cement anchors secure the unit in place. Unit is relocateable and finished in gray polyurethane enamel. 36” heavy duty steel door with standard lever handle and 3 dead bolts. Texas Tech tested and approved wall design for both FEMA 320 & ICC-500 (2008) standards.